Love is in the air whenever we’re in our little garden paradise! We can feel it everywhere and every moment. Whether it is admiring our babies as we walk leisurely by, standing transfixed with awe at God’s creations, being hard at work or playing in the dirt… the atmosphere is contagious! 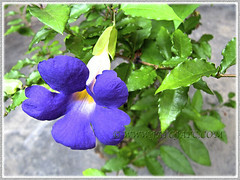 We heart our plants and they respond with love selflessly and unconditionally as we do. In the garden, it’s a celebration of love everyday between our plants and us gardeners – their caregivers! It’s entirely different from Valentine’s Day of love that breezed through just one day on February 14th of each year. 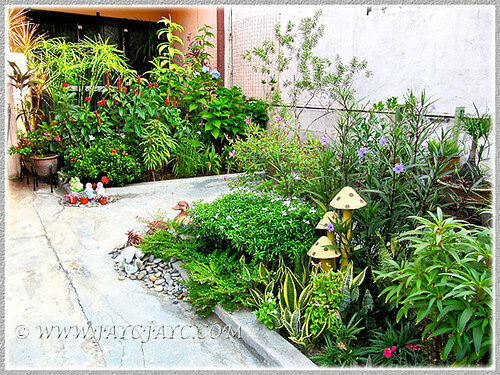 Another view of our tropical garden’s bountiful blessings at the front yard, February 23 2014. A closer view of the outer garden bed and the area beside it, February 23 2014. 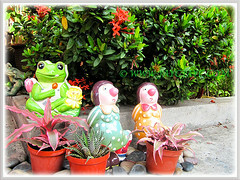 Garden figurines, between Dwarf Red Ixora at the back and Cryptanthus + Cactus in the front – February 4 2014. 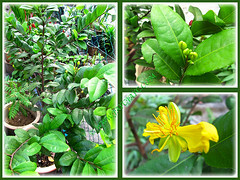 Rhododendron simsii (Indoor/Indian/Chinese Azalea, Sim’s Azalea), flowering profusely, January 28 2014. 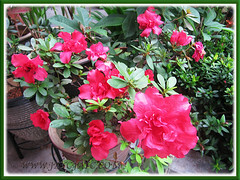 Just perfect to welcome the Chinese Lunar Year. Epipremnum aureum ‘Marble Queen’ (Pothos, Money Plant), February 22 2014. Seemed happy being potted and relocated to the car porch. First time flowering for this dwarf species of Agapanthus (African Lily) under our care, January 16-28, 2014. Lovely to observe its budding and blooming process. 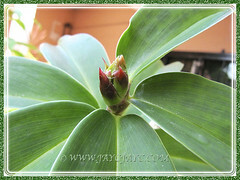 So exciting to see the first bud of our Costus speciosus (Crepe/Spiral Ginger), February 23 2014. The whole clump enjoys being relocated from pot to ground. Propagated from stem cuttings about 2 years ago. 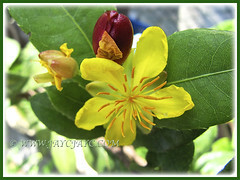 Our 3-ft-tall Ochna kirkii (Mickey Mouse Plant or Bird’s Eye Bush) was grown from seed about 2 years ago. Flowering for the first time to amaze us, February 10 2014. Closeup of Mickey Mouse Plant’s yellow flowers and bud-like red calyxes, Feb. 22 2014. Charming and interesting! Potted Nolina/Beaucarnea recurvata (Ponytail/Bottle Palm, Elephant’s Foot), January 28 2014. 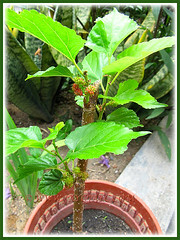 This plant was given a hard prune several months ago and amazed us with many sprouts of ‘ponytails’ a few months later. 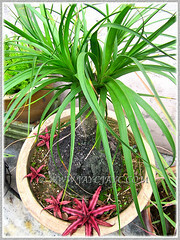 Some Cryptanthus bivittatus ‘Ruby’ (Earth Star) were added to add interest. At the outer border, this strikingly beautiful Dianthus ‘Telstar Purple Picotee’ pops up occasionally to treat us, February 4 2014. 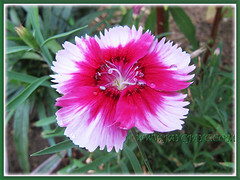 Growing beside it is another clump of Dianthus that produces vibrant magenta-coloured flowers and they’re more prolific and free flowering than this bi-coloured one. Mainly foliage plants at our courtyard, February 23, 2014. 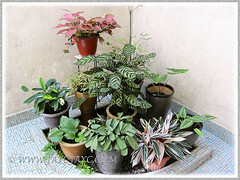 They are Schismatoglottis calyptrata, Stomanthe sanguinea ‘Tricolor’, Ctenanthe burle-marxii ‘Amagris’, Proiphys amboinensis (Cardwell Lily), Ctenanthe pilosa ‘Golden Mosaic’, Variegated Alocasia, Calathea makoyana (Peacock Plant), Dracaena reflexa (Song of India), Dracaena surculosa ‘Florida Beauty’ and Aglaonema cv. Valentine. 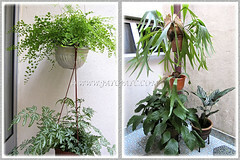 Southern Maidenhair Fern, Silver Lace Fern, Platycerium bifurcatum (Staghorn Fern), Spathiphyllum sp. 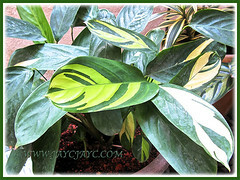 (Peace Lily) and Calathea ornata ‘Sanderiana’. Even non-flowering, they’re a sight to behold. 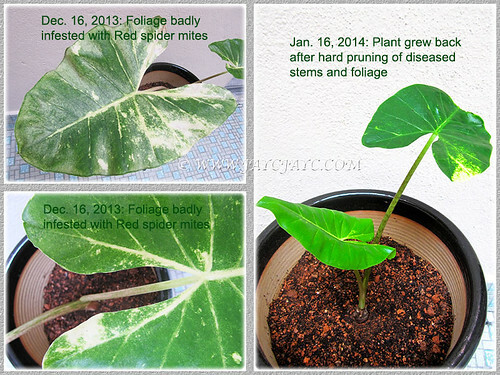 Humph… an ongoing battle with infestation of red spider mites at our courtyard! It’s a never-ending struggle to keep garden pests at bay. All the more difficult when we try not to use pesticides in our garden. The alternatives, such as the Bio organic insect repellents (Neem Spray) or homemade solutions of Dishwashing liquid/oil/water are too mild and ineffective. 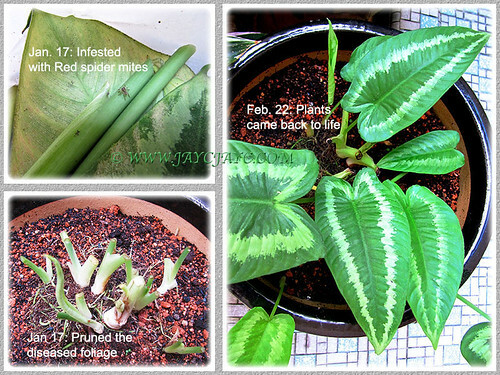 Usually, I’d give a hard prune when all else fail and hope for the best… and this normally works well as seen in the following images of the Variegated Alocasia and Schismatoglottis calyptrata below. Terribly happy that they’re alive again. Care to share what pest control methods you apply? 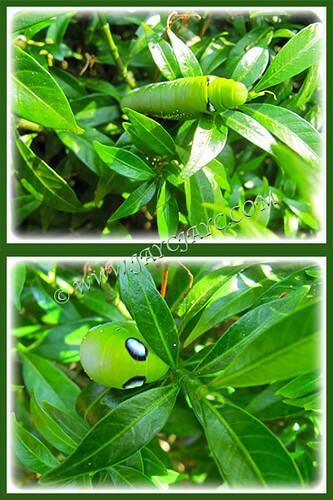 Recently, a new garden pest which I’ve never seen before found its way into our garden. 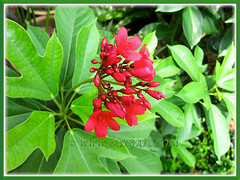 Our Jatropha integerrima (Spicy Jatropha) plants that were growing so well, got snuffed out suddenly by these white-coated insects that smell bloody when squashed with my fingers. Thank goodness, I have two remaining healthy stems after shaving off the other two diseased ones. Got to keep vigilant now! We’d love to know the ID of this horrible pest. Anyone knows? 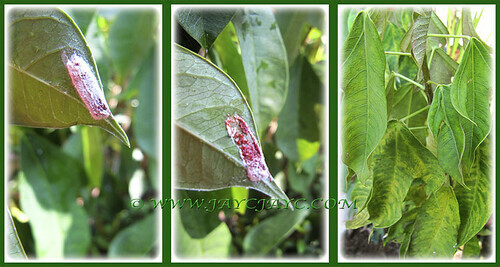 Found out recently that these are cottony egg masses or ovisac (up to 10mm long) of the soft scale insects. Probably a specie of Pulvinaria (ref. : Bug Guide.net). Another newly acquired plant, Marantha arundinacea ‘Variegata’ (Obedience Plant, Arrowroot) in February 22 2014. 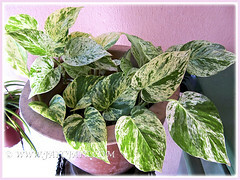 We simply love variegated foliage plants… just perfect for our courtyard. Since it loves the sun, it’ll replace our dying Walking Iris at the outer bed. We love nature and nature loves us! 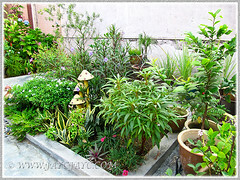 We never tire of seeing and admiring nature that abounds in our concrete garden and in the vicinity. How blessed to be able to enjoy glimpses of these visitors and capture up-close photos of them. 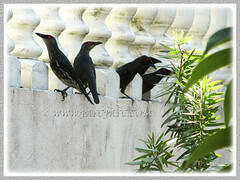 A flock of Asian Glossy Starling in our garden, February 16 2014. Daily seen in our garden and nearby surroundings, atop trees, palms and overhead cables. Their red eyes stands out conspicuously against their dark glossy green plumage which appears black from afar or in poor light. It’s considered as one of the noisiest species of birds. 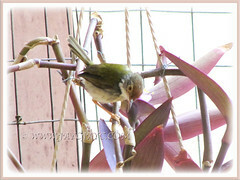 A Common Tailorbird (Orthotomus sutorius), seen sourcing for food on Tradecantia pallida ‘Purple Heart’, February 25 2014. Lovely to catch glimpses of this daily visitor flitting about among the plants/flowers, probing them with its curved bill. A A chartreuse Dragonfly on Purple Heart, January 19 2014. Beautiful creature that frequents our garden. Would love to know its ID… unable to nail its ID so far! 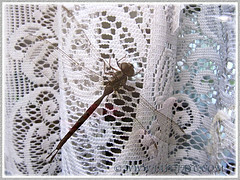 An unidentified dragonfly decided to fly into our home, February 25 2014.Surprised to see this insect wheezing noisily between our lace curtain and sliding glass window at the sitting hall. When disturbed it flew to the ceiling and remained still until late evening. Hahahah… from outside, in the garden to inside, our home! 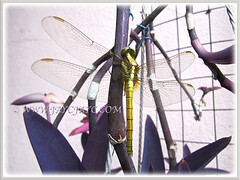 Dragonflies, moths, butterflies, potter wasps and the likes, and even snakes have wandered indoors before. Probably, by instinct, these lovely creatures know that we love them (not the snakes though!) and wanna be our adoptees? We got this plant from Cameron Highlands about 4 months ago and rather surprised that it’s still growing well and flowering for us. It’s potted in a mixture of black garden soil and burnt clay soil, watered every other day, fed with organic granules once monthly and located in a semi-shaded site. 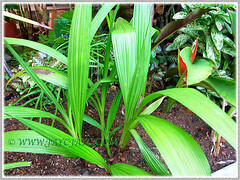 Noticed that this dwarf variety with very slender ½-inch-width leaves is not as hardy as the normal ones, needing less water otherwise the exposed roots tend to rot and leaves turn yellow. 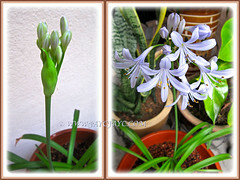 Read more about Agapanthus culture at https://www.jaycjayc.com/agapanthus-african-blue-lily/. Wishing you success in keeping your plants alive. 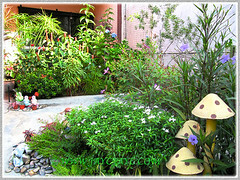 Your beautiful garden as always, some plants are attacked by insects occasionally, it happens to everyone, but with pruning and treatment regained. Hugs from Venezuela. Thanks for dropping by, Yara, and taking the trouble to post your generous comments. Happy gardening and hugs too from Malaysia!